Hey all - crazy times around here - birthday parties, hockey wind-ups, taxes, a new lake lot . . . busy busy!! But I DO have a brand new layout to share with you today that I absolutely ADORE!! Our song this week at Scrap it with a Song is "Somewhere Over the Rainbow" by Judy Garland. My page design for this one came from this Page Maps sketch. Love how all the elements came together on this page! I do hope you'll be inspired to come play along at Scrap it with a Song - this month all of our songs are about colour!! 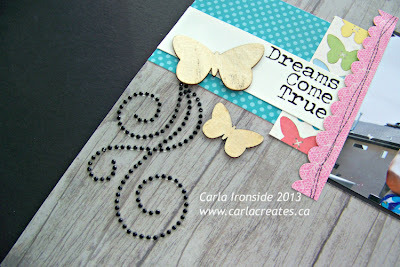 And I also hope you'll be inspired to give mixing different paper collections a try like I did on this layout! I'd love to see how you 'mix it up' - - if you do, be sure to leave me a link in the comments below so I can come check out your creations! Song inspired layouts can be linked up at SIWAS for a chance to be our May Guest Designer! What a pretty layout, love the woodgrain paper! This is beautiful. So many wonderful details. So lovely as usual! Can't wait to hear about the new lake lot! Love your layout, so cute!